Checking your vaginal pH can help you determine whether you’re suffering from a bacterial infection or a yeast infection. The test is very easy to do and it takes only 15 seconds to get the results, so it’s worth investing in a box of Phinex Diagnostic pH Test Strips to monitor your vaginal health. The plastic box comes with 160 strips. The strips are small, their size is: 2 1/2″ X 1/4″ (6,35cm X 0,60 cm). The producer claims that the strips come in a wider range of readings and more bright colors, which makes them more reliable and accurate than most pH test strips. They are made of professional grade material, they don’t bleed and they are easy to read with increments from 4.5 to 9.0. They come with a chart that let you see what your results mean and compare them to what is optimal. Apart from testing vaginal discharge, Phinex pH strips can be used for testing urine or saliva to monitor your overall health. A healthy urine and saliva pH is in the range of 7.0 – 7.6. Compare the values shown by the outer part with the chart on the box, if the color is a bit off, check the inner pad. The results are usually very accurate. The strips are easy to use. 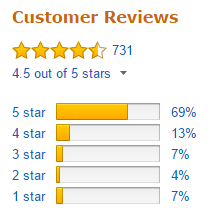 82% of 4 and 5-star reviews on Amazon. When the color is off, it may be difficult to read the result. If you’ve got difficulties reading the result, try repeating the test. 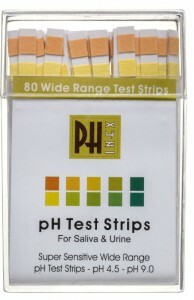 Although the Phinex Diagnostic pH Test Strips are easy to use, they come without instructions. The plastic container makes it hard to get the lid on and off, so be careful when first opening them. Whether you get recurrent yeast or bacterial infections, or just sporadic ones, you’ll find the Phinex Diagnostic pH Test Strips useful to help you determine what sort of infection you’re suffering from if your symptoms seem confusing. So it’s worth keeping a box of pH test strips in your bathroom, plus it’ll last you for a long time! you can buy them on Amazon .